MANUEL MOLINO is a dancer with PLAY / Michèle Murray. 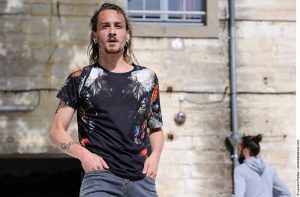 Of French nationality, he studies at the “EPSEDANSE” dance school in Montpellier, France during three years where, he obtains his dance degree (EAT). During this period, he works with choreographers Anne-Marie Porras, Didier Théron, Claude Brumachon, Thierry Malandain, Angelin Preljocaj and Hofesh Shechter. He is currently working as a dancer and assistant with Sita Ostheimer. He has been working on the “ATLAS / STUDIES” project with PLAY / Michèle Murray since 2014. Through his studies and diverse professional experiences, he has become interested in different dance styles, such as ballet, performance art, physical acting, as well as clown techniques.